I know a lot of you out there are worried right now about rising airfares. I’m being asked all the time, “Should I buy it now or wait?” For myself I’m a control freak, so if I know where I’m heading I’m going to buy my ticket so I can choose the schedule, seat and even the type of aircraft. But what if the fares go down, you say. Well believe it or not airlines still give refunds if a sale comes up and your ticket price goes down. The catch is simple, you have to pay their administrative fee before you see any refund, so just be sure your savings are more than $150 and ask for your money back. You may be pleasantly surprised. – If you are staying with family (as I am), don’t bring up hot topics like politics, religion or why your parents are just plain crazy. Stay away from things that you’re bound to disagree on. Oh and don’t give in to old patterns. People will try to push your buttons, bite your tongue or count to 10. – Do buy groceries, cook a meal, help out around the house, and keep your room tidy. Trust me this will reduce your stress and your hosts. – Ask for things you can’t find. No one likes having guests poking around their cupboards looking for things. Oh and stay out of that vanity. It’s rude to snoop. – Make sure you have a couple of days where you can just go out on your own and get out of your hosts way. They’ll appreciate the breathing room, and you will too. – Send a thank you gift. 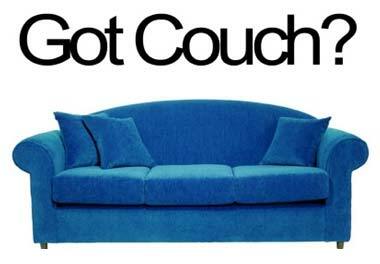 If you’ve crashed on some one’s couch for more than 2 weeks (yeah I’m guilty of this), send them some love. It doesn’t have to be big, just something thoughtful that will make them smile…and want to invite you back. Wondering about my original post? It’s here if you want to check it out. As we come up on Memorial Day weekend and the kick-off of Summer travel I’ve been noticing a couple of notable developments in the travel sphere. First peak travel fees are back. You first saw them charged for flights on Christmas and Thanksgiving in 2009. In 2010 they expanded to include Super Bowl weekend, Mother’s Day and Easter. This Summer they are everywhere. Peak fares fees of $10 – $30 are being charged from June 10 – August 22nd. That’s almost the entire Summer. Oh and be sure to look for the oil surcharge to surge as well. Revenue stricken airlines are beginning to assess big fees, particularly on Europe flights, to cover the high cost of jet fuel. Maybe it’s time to consider a driving vacation. Despite the spill in the Gulf, oil prices are going down in anticipation of the Summer travel boom. For the first time in years other Americans plan to stay home, so you may even have the road to yourself. Americans you’re traveling again and I applaud you for that. I’m so glad to see your optimism has returned and you’re back enjoying the open road. The U.S. could use your help. One thing that I have noticed in my recent travels is that middle America is struggling. I’m talking about small businesses, Mom and Pop diners, corner drugstores and retail. I’ve been in a number of small towns where 1/3 of the Downtown is papered over shops with “for lease” signs out front. Businesses, especially small businesses are barely hanging on. How can you help? Buy locally. I’ve said this before, but it’s still important. Road tripping? Get off that freeway/McDonald’s gravy train and stop into a small town instead. I guarantee you there will be a couple of restaurants and usually a coffee shop on the town square. These places are run by locals, often support local farms and employ people from their communities. If you really want to do something for your country, leave the Wal-Mart and shop at the charming old school drugstore. It may cost a bit more, but isn’t it worth it to help your neighbors? I know they’ll appreciate it! You haven’t flown since Christmas and you’re wondering what’s changed. While you were hibernating this past Winter the airlines were busy raising airfares and adding or increasing fees. The major U.S. carriers raised their checked bag fee earlier this year from $15 to $25 for the first bag. Then Spirit upped the ante by adding a carry-on bag fee of $45 per bag. How do you avoid this labyrinth of charges? Check out this USAToday.com article on the worst travel ripoffs and strategies for avoiding them. Then pack your flip flops and get ready for Summer. It’s travel time! For me travel is a way to explore a life I might have lead. In Paris I imagine I’m a student walking along the Siene and soaking up great art. In Russia I hired a driver and channeled my inner czarina. You can leave your daily life behind and be anything you’d like on vacation. Create a base of operations – Hotels are great, but there are so many new options out there now. Rent an apartment, a cottage by the sea or even a castle. Try a home swap if you can. Even if you just get a hotel room with a kitchen it will feel more like home. Once your settled, plan day trips. It’s a great way to see things most people miss. Plan a longer stay – Humans are creatures of habit and I find it takes at least a week to develop a routine. Find a favorite coffee shop, gelato stand or even a park bench and make it part of your daily routine to stop there and people watch. Learn a few phrases in the language – Please, thank you and excuse me are my standards. It’s also nice to be able to say hello and goodbye. Your pronunciation may not be perfect, but I’ve always found that people are proud of their language and appreciate your interest and willingness to try and speak with them. Just remember if they drop into your language it’s best to follow. Talk to people – These days with Twitter, TravelAdvisor and Yelp you can chat with locals before you arrive. Friends and family are also a great resource. If they’ve been where you’re going pick their brains. However, when you arrive don’t cocoon yourself. Talk to people. Locals may find it a bit weird, but we all like being knowledgeable. Too intimidating? Ask your hotel clerk or doorman for advice. Be open – Some of my best travel memories come from the times I stumbled upon something unexpected. I love to just drive around and look for things to see or do. A few of my favorite finds ~ a castle in Ireland where the owner gave me a private tour, a tour of the catacombs beneath the Old Cathedral in Cuenca (hey sometimes you just have to ask…), a sunny hilltop restaurant in Sweden with a million dollar view, and a small Russian village in Alaska with a beautiful orthodox church. Quito is unique among major South American cities in that it has metered taxis. What is not unique is that 4 in 5 drivers refuse to use them, quoting you inflated prices to get from point A to point B. Moreover, most travel guides give lousy advice as to what taxi rides ought cost in Quito. For example, at least three web-sites state that it costs about $8.00 to get from La Mariscal (“Gringolandia”) to the northern bus terminal, “Terminal Terrestre Carcelen”, where you can catch buses to Otavalo and Imbabura, but this is cr*p! On the meter, from the “Centro Historico” which by the way is further away from Carcelen than Gringolandia, this trip is $5.80. From La Mariscal, it should be no more than $4.00. So…as a public service, we’ve cooked up a little table that’ll give you the skinny on what it should cost to get around Quito by taxi. Where to Where… On the Meter… Negotiate for… You got soaked! Keep in mind that taxis in Quito charge by time, not by distance. So a trip from Gringolandia to the old city, is a bit more expensive than the distance would normally indicate, given the horrible traffic. Also, most taxi drivers will quote a couple extra dollars at night. So keep that in mind when you negotiate. In addition, *USE SPANISH* when negotiating with taxi drivers. They’re much less likely to try and soak you if you use a well placed, “…demasiado!” (“too much!”) and a counter offer. And finally, if you have to negotiate the fare…don’t tip the driver! He (she) has already included a percentage for themselves.